This breakfast casserole is a family favorite and so perfect for serving up during the holiday season or anytime! Loaded with sautéed onion, Tribelli Mini Peppers, mushrooms, and ham the flavors are savory and SO delicious. 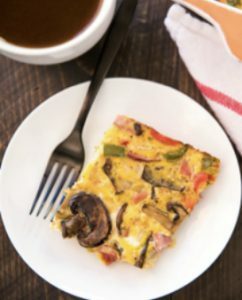 Not only is this breakfast casserole recipe a cinch to whip up, it’s healthy and will keep you satisfied for hours. Sauté the veggies: Heat a large skillet with oil or a generous amount of cooking spray and add sliced mushrooms. Cook over high heat for 3-4 minutes and add both varieties of peppers. Continue cooking over high heat and stirring occasionally for 2-3 minutes and add the onions and garlic. Cook everything together on high heat for another 2 minutes. Remove from heat. Add the ham and mix well; set aside. 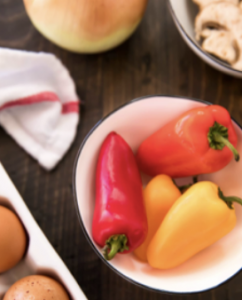 Eggs: Whisk the eggs with salt, pepper and Sriracha; set aside. Bake: Spray a 10 x 8 or similar sized baking dish with cooking spray and transfer the veggie/ham mixture to the baking dish. Then, pour the egg mixture evenly over the veggie/ham mixture. Bake for 30-35 minutes or until cooked through and golden brown on top. Once cooked, rest for a few minutes before slicing.